Polish Talmudist; born in the second decade of the seventeenth century; died at Metz March 20, 1693. His family name was really , "Ulif," "Olive"(? ), the surname "Ashkenazi" being usually bestowed in Poland upon families of German extraction. 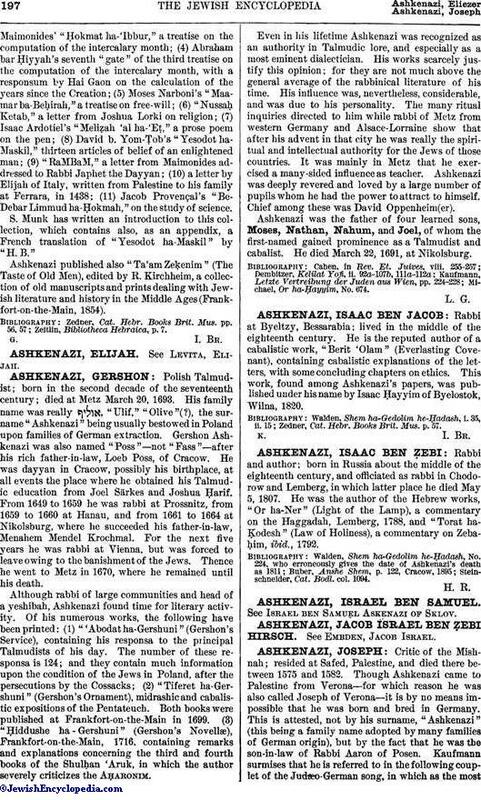 Gershon Ashkenazi was also named "Poss"—not "Fass"—after his rich father-in-law, Loeb Poss, of Cracow. He was dayyan in Cracow, possibly his birthplace, at all events the place where he obtained his Talmudic education from Joel Särkes and Joshua Ḥarif. From 1649 to 1659 he was rabbi at Prossnitz, from 1659 to 1660 at Hanau, and from 1661 to 1664 at Nikolsburg, where he succeeded his father-in-law, Menahem Mendel Krochmal. For the next five years he was rabbi at Vienna, but was forced to leave owing to the banishment of the Jews. Thence he went to Metz in 1670, where he remained until his death.